Get ready for the most colorful fun-filled day of your life! You’ll have more color on you than your happy levels can handle! So get your friends and family stretched out for this amazing color blast event where you'll get blasted with color while you run the Color Vibe 5K. Color Vibe is here, and you’re about to get tagged! You'll be blasted at every color station throughout this awesome 5K run. Sign up fast, because spots are filling quickly and we have a limited number of shirts available. So grab your girlfriends, your bro’s, your friends, and your family cause we’re bringing a color fun experience to your life that you never knew existed! 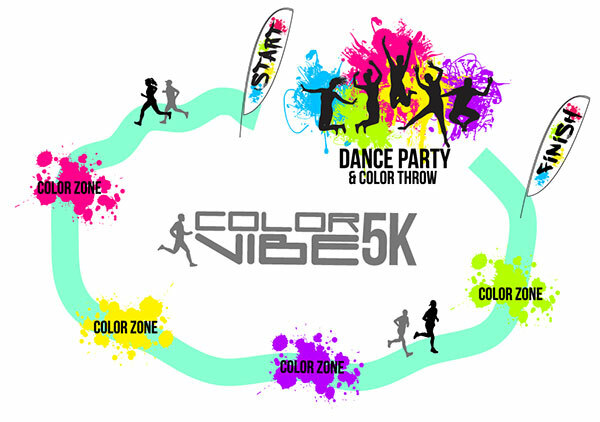 So join us for the Color Vibe 5K run in your city and get ready to be tagged with color! The Color Vibe 5k run will be held at the Franklin County Fairgrounds. *You may purchase additional Color Vibe color packs during your registration. Register now before it sells out! » Up to 2 kids may be registered to run for each paid adult. » Processing fee of $4.25 still applies. Each kid registered will receive a race bib to participate. » No t-shirt or color pack is supplied with the kids registration. However, they are available for purchase. » All kids must be registered in order to participate in the event. For more information on how we can help or to apply to become a Color Vibe charity partner please email charity@thecolorvibe.com. We are partnering with local sponsors to make this an awesome event, and we’d love to have your business involved. There are a ton of ways that you can contribute and have your business benefit. Just send us an email at sponsor@thecolorvibe.com and let’s talk! Color Vibe is ready to hook you up with stuff for your race packet. Race packets will be available for pickup the day before and also the morning of the event. We’ll email you more details as well as post the location of packet pick-up here. We’re putting the final touches on everything, but don’t worry, we’ll get you everything you need! Check back with us as we get closer to the event and we’ll have it all here for you. We’ll also blast out an email with more information as we get closer, so you’ll be all set for Color Vibe event! The waiver that each participant must agree to is listed below. Be sure to sign the waiver BEFORE YOU RUN! No waiver, no run, no exceptions! All participants are required to sign a release waiver to run in the Color Vibe Race Series. Upon registering you'll be able to digitally sign the release waiver. I know and understand that participating in a 5K run with color is a potentially hazardous activity. I know, recognize, understand, and appreciate these risks, realizing this is a strenuous activity which requires physical conditioning and hereby represent and certify that I am in good health and in physical condition to participate in this event.I assume all risks associated with running or walking in this event and acknowledge it carries with it the potential for property loss, serious injury, or death. I understand the risks include, but are not limited to, those caused by terrain, falls, contact with other participants, lack of hydration, traffic, obstacles, fire, weather, bee stings or bites, actions of other people including, but not limited to, participants, volunteers, spectators, coaches, event officials and event monitors, and/or Administrators of the event. All such and related risks being known and appreciated by me. I also agree to obey all laws while participating in the event. I also agree to immediately adhere to directions given me by event officials as well as law enforcement and emergency personnel. I acknowledge that this is a running and/or walking event that involves physical activity, is a test of my physical and mental limits and carries a potential for moderate and serious injury, death, property loss or damage. I also acknowledge that the Event involves spraying a corn-starch colorant (“Colorant”) and may cause skin irritation, itching, burning, discomfort or vision problems, permanently stain or damage any of my personal belongings or property. I acknowledge the Event has properly warned of the effects involved with the Colorant, and advises me to wear proper eye, nose and mouth protection at all times. I understand the risks involved with attending the Event that may include, but not limited to: falls, slips, contact and/or crashes with other Attendees, injuries from contact with the Colorant, effects of weather including heat and/or humidity, cold, defective equipment, condition of the roads and/or course, rough terrain, heavy rain, water hazards, hazards posed by spectators or other Attendees, man-made or natural obstacles, wild animals, insects, and poisonous plants. I ASSUME ALL RISKS INVOLVED WITH THE EVENT, THE COURSE, EQUIPMENT AND THE COLORANT. I agree to monitor my health while participating in the Event, and will withdraw from the Event immediately and seek medical personnel if I believe continuing will present a risk to myself or other Attendees. I agree that I will fully inspect the course before participating, and notify the Event’s personnel immediately of any hazardous situations. I agree to wear appropriate clothing and foot attire as established by industry standards and common safety practices during all activities at the Event. I acknowledge that I am not under the influence of alcohol, nor am I, nor will I be at the time of the event, under the influence of any drugs, including prescription, illegal or over-the counter medication, which could impair my ability to participate in the Color Vibe event. If I am taking medication, I affirm that I have seen a physician and have approval from him or her to participate in the Color Vibe event while under the influence of medication. I attest and verify that I am physically fit, have sufficiently trained for the Event, and my physical condition has been verified acceptable to participate in the Event by a medical doctor prior to attending. I am covered by medical insurance, individually or as part of an organization. Further, I give my consent to medical treatment in the event of an emergency or other incident, in which, in the reasonable judgment of the on-site personnel, I require medical care. I assume all liability for any and all medical expenses incurred as a result of training for and/or attending the Event, including but not limited to: ambulance transportation, medical attention, medical treatment or services, hospital stays, physician and pharmaceutical goods and services. In consideration of the acceptance of my participation, I hereby for myself, or anyone else who might claim on my behalf, covenant not to sue, and waive, release, and discharge all companies involved with the organization of the color run, including all sponsors, partners, and affiliates, of this event from any and all claims or liability of any kind or nature whatsoever arising out of my participation in this event, even though such liability may arise out of negligence or carelessness on the part of event organizers, sponsors, partners and affiliates. I understand that by participating in this event, I acknowledge the acceptance of the terms and conditions within this release waiver. Participant or Guardian does hereby release and forever discharge Color Vibe from any claim whatsoever which arises or may hereafter arise on account of any first aid, treatment, or service rendered in connection with the Participant’s activities with Color Vibe. The Participant or guardian acknowledges that Color Vibe does not carry or maintain any health, medical, or disability insurance for any Participants. It is understood that the Participant obtain his or her own health or medical insurance coverage as necessary. Having read and understood this waiver and in consideration of your accepting my entry, I for myself and anyone entitled to act on my behalf, waive and release Color Vibe, race organizers and volunteers, venue, facilities, land owners, and all sponsors, their representatives and successors from all claims or liabilities of any kind resulting from my participation in this event even though that liability may arise out of negligence or carelessness on the part of the persons named in this waiver. I further agree that Color Vibe, race organizers, volunteers, venue, facilities, land owners and all sponsors, their representatives, successors and assigns (collectively the “Licensee”) may take still or moving photographs or other recordings of me, or of my property (including any photographs or film footage that I may provide) during and in connection with the race in which I am participating (the “Footage”). I hereby grant to the Licensee, its successors, assigns and licensees an irrevocable license to use and reproduce, in whole or in part, the contents of the Footage, my name, my likeness, image, voice, appearance, or that of my property and biographical information about me in connection with the race in which I am participating and the production and exploitation thereof, in any and all manners and media, throughout the world, in perpetuity, for marketing, promotional, advertising, public relations or commercial purposes via videos, publications, advertisements, news releases, websites, including social media, and any promotional materials in any other medium. I grant permission to all the foregoing parties to use any photographs, motion pictures, recordings, or any other record of this event for any legitimate purpose. I understand that pets, bicycles, skateboards, roller-blades, or scooters are not allowed in any event. I will abide by these guidelines. I agree, on my own behalf and on behalf of my heirs, estate, successors and assigns, to indemnify and hold harmless Color Vibe, LLC any/all related Contributing Entities under any name associated with the Event Organizers, Color Vibe Run, TheColorVibe.com, all venues, facilities, landowners, producers, sponsors, co-sponsors, advertisers, organizers, material suppliers, vendors, concessionaires, volunteers and/or contractors of any of the Event in which I may participate and/or attend, and all employees, principals, directors, shareholders, agents, members, managers, affiliates, trade partners, production services, shipping, manufacturers, designers, representatives, attorneys and insurers of each of the foregoing (collectively, the “Released Parties”) against, any lawsuits, demands, claims, or expenses (including attorneys’ fees and legal costs), arising from or in any manner related to my registering for or attending the Event; and to the fullest extent permitted by law, I fully and forever waive, release, discharges and covenants not to sue Released Parties for and from any and all demands, claims, actions, suits, damages, losses, liabilities, costs and expenses arising, directly or indirectly, in related to, in connection with or relating to my participation or attending the Event from any cause whatsoever (including, but not limited to, damage or loss of property, bodily injuries, medical treatment and death), whether or not foreseeable or contributed to by the negligent acts or omissions of others. I acknowledge that the RELEASED PARTIES MAKE NO REPRESENTATION OR WARRANTY, EXPRESS OR IMPLIED, REGARDING THE EVENT and agree that the Released Parties will not, under any circumstance, be liable for consequential, indirect, general, special or similar damages. I acknowledge that this release and waiver of liability agreement will be used by the Released Parties and that it governs the legal rights and responsibilities of both me and the Released Parties. Further, I hereby grant to Released Parties the worldwide right in perpetuity to use and publish my name, my likeness, my voice, and/or my picture, singly or as part of composite or reproductions, in color or otherwise, in any medium now known or in the future devised, including but not limited to, broadcast, telecast, advertising, promotion, or other account of the Event in any form and for any purpose, without compensation or approval. I understand that my entry fee is nonrefundable under any circumstances. I understand there are no refunds. I do hereby fully release and forever discharge Color Vibe, LLC and its partners from any and all claims for injuries, illnesses, damages, expenses or loss that me or my minor child may suffer arising out of, connected with, or in any way associated with the race, program or activities. I have read and fully understand the above important information warning of risk, assumption of risk, waiver and release of claims. . If any Event is canceled for any reason due to circumstances beyond reasonable control, the Event and/or Released Parties have no obligation to refund my entry fee or any other costs and/or expenses I incurred in connection with the Event. I understand that the bib is non-replaceable, and if lost my bib and entry will not be replaced. The Event and Released Parties have the right to reject my entry for any reason. This Waiver is a legally binding Agreement and will be construed broadly to provide a release and waiver to the maximum extent permissible under applicable law. Any provisions found to be void or unenforceable shall be severed from this agreement, and not affect the validity or enforceability of any other provisions. FOR ATTENDEES UNDER EIGHTEEN (18) YEARS OF AGE A PARENT OR LEGAL GUARDIAN MUST SIGN BELOW. Attendee’s Parent or Guardian’s signature below certifies that Attendee’s son/daughter/ward has permission to participate/attend the Event. Attendee’s Parent/Guardian has read and understands the foregoing WAIVER AND RELEASE AGREEMENT (above) and by signing intentionally and voluntarily agrees to its terms and conditions. Attendee’s Parent/Guardian further certifies that such son/daughter/ward is in good physical condition and is able to safely participate in the Event. Attendee’s Parent/Guardian hereby authorizes medical treatment for such son/daughter and grants access to such child’s medical records as necessary and as stated above. I have read this document and I fully understand its content, warning of risk, assumption of risk and waiver and release of all claims. I understand that by signing below, I have given up substantial rights. I have voluntarily signed this release. By signing below you agree, warrant and covenant as follows. I HEREBY AFFIRM THAT I AM EIGHTEEN (18) YEARS OF AGE OR OLDER. I HAVE READ THIS DOCUMENT AND UNDERSTAND ITS CONTENTS. Do you like to throw color at people? You’re hired! We love volunteers, and we couldn't do it without you! This is your chance to be part of this awesome event without having to run the full 5k to get your color fix on. As an official Color Vibe Color Volunteer you'll be able to tag runners to your hearts delight! And there may just be some sweet stuff in store for you for. We do have limited spots available for volunteers so get signed up today and come help be a part of what makes Color Vibe so great! Please fill out the following information to volunteer. Connect with other Greater Springfield Area Color Vibe runners in the comments below.